Did you know flying is possible? If you want to fly close to the clouds choose our paraglider service. You’ll fall in love with this experience! Paragliding service over the Forest Crown and the “Barranco del Infierno”. Including transport to the flying area. Enjoy the adrenaline and emotion rush with this paragliding tandem experience that Overfly Tenerife has prepared for you! Live a very intense time with our High Performance Flight. Fly in thermals currents and fulfill that dream with this incredible flight. Have the best imaginable views whilst flying over 1000 meters above the ground. This flight is suitable for beginners. You will be flying with an experienced instructor who will accompany you in this experience. Your instructor will take the controls and guide you to the best places with the most spectacular views of Tenerife south. Our company provides all the paragliding equipment that our instructor and you need for this tandem flight. The things you have to bring are only comfortable clothes, trainers and a lot of desire to have fun! You’ll receive briefing instructions before you start your Performance Flight. This way our instructors will equip you with a harness and helmet and explain the take-off procedure. You will be informed at all times so that you have a wonderful experience. 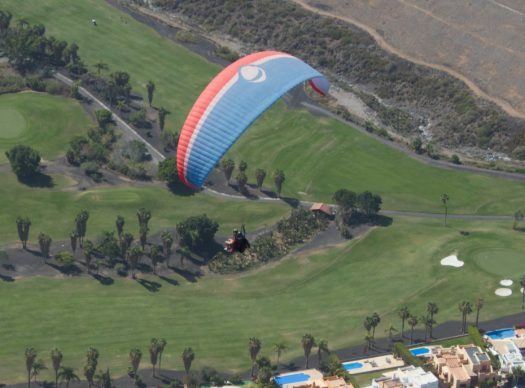 This paraglider service (High Performance Flight) will allow you to fly cross country and exceed a thousand meters in altitude. If you’re feeling adventurous, ask your instructor to let you take the controls for piloting your glider, giving you the perfect chance to try your hand at paragliding. Paragliding in Tenerife means getting to know this place from a privileged point of view. Once your take-off, the paragliding experience will be comfortable as you will find yourself seated in a safe harness. The pilot will show you the different views that can be seen from this flight, such as Barranco del Infierno, Roque del Conde and Playa de las Américas. Are you ready to try our High Performance Flight? Come with us and get ready to live the best life experience. Once you take off, the experience will be comfortable as you will find yourself comfortably seated in a safe harness. The pilot will be able to show you the different views that can be seen from this flight, such as Barranco del Infierno, Roque del Conde and Playa de las Américas. The duration of the flight is between 20 and 25 minutes but you will need 2 hours of time in total for the experience including transportation.